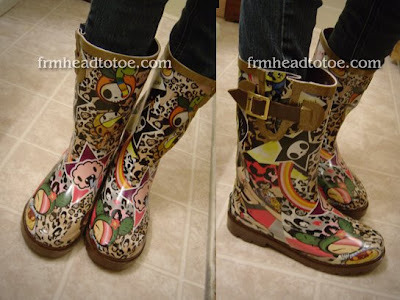 I've been eyeing these Tokidoki Chooka rainboots for a while now since I was happy to see they come in kids' sizes. Sadly, I don't fit anywhere near the taller women's style as they start at a size 6 and run a size large! I ordered these leopard print ones from zappos.com though and as tacky and busy as they are, I LOVE them. As my friend Jenny said, "How can you not love them? They have a cloud throwing up lightning!" I just ordered them on Saturday and Zappos decided to upgrade my shipping to priority for free so I literally just got them today. They are a size 1, and they fit just about perfect on my smaller-size-4-womens' feet. Another exciting thing that happened today was that I found out I won the much coveted Hello Kitty fauxnad plate from the awesome Polish Pixie. I have been looking for this plate everywhere on Ebay and got rejection upon rejection message from sellers! I was floored because I absolutely never win anything. Shipping will take a couple weeks since the pixie herself resides in Denmark, but when I get the plates I promise I will do a Konad nail tutorial for you guys. :D I cannot wait! Here is a pic taken from polishpixie.blogspot.com. Kitty is on the right. 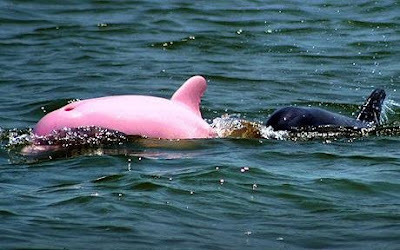 Also, to compound the awesomeness of the moment, has everyone seen this photo of a pink dolphin? It's REALLY, REALLY pink. I feel like I should scream really quietly in happiness. It got its coloration from albinism. Who knew! While I try to contain my enthusiasm, you must tell me your thoughts on rainboots (or pink dolphins). Are they awesome, lame, necessary, cute, ugly? Do you have a pair? Let me know in the comments! the boots are sooo cute! i only have one pair of rain boots that i got from target. it doesnt rain much where i live. Hi Jen, the boots are a flop... sorry.. for toki doki stick to bags or wallets; the print on the boot is stretched out and not very pretty. If the print were smaller, it might have looked cuter =\ it's obviously not your fault. Anyway, since you asked for our opinion, here is it. Oh and the pink dolphin.. IS IT REAL? omg. so cute! Anyways, I think that your boots are super cute. It doesn't rain a lot here (mostly either hail and slush or burning hot, mucky heat waves) or else I would have bought these boots I fell in love with at Macy's back in November.. aw. Those boots look amazing on you! I saw them a while back as well.. but i'm still debating on whether i should get them or not.. because i'm not really a rain boot kind of person =P. But i can honestly say they look so cute on you! Hey I love your blog and I am a regular reader! Well I just wanted to give you a heads up on someone who has been using your pics on thefashionspot.com! >__<;; Her sn is CottonShrinks and I believe she also has an account on soompi. Her blog is http://cottonshrinks.blogspot.com. Sammi: Thanks for the heads up. Yeah, I don't have a fashionspot account and it looks like you have to be invited to join. As always, I would appreciate it if you could stick up for me. Please report the incident to the mods, message the person and ask if she can take the photos down, or at least explain that it is not her and link back to my blog, http://www.frmheadtotoe.com. Or you could even reply in that thread with a link back here so that others know the truth! Pink dolphin is so awesome. Rainboots are too cute! those rainboots look horrid. they make you look like a 12 year old. i think your rainboots look adorable! i'm still searching for a pair myself. hehe, i saw these at this shoe store a few days back ~ but they were selling them for like 250$ ! T__T"